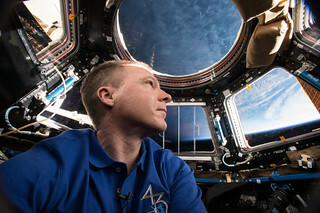 ISS043E241729 (05/24/2015) --- Expedition 43 commander and NASA astronaut Terry Virts is seen here inside of the station's Cupola module. The Cupola is designed for the observation of operations outside the ISS such as robotic activities, the approach of vehicles, and spacewalks. It also provides spectacular views of Earth and celestial objects for use in astronaut observation experiments. It houses the robotic workstation that controls the space station's robotic arm and can accommodate two crewmembers simultaneously.